NASA's small MarCO-B cubesat took this photo of Mars from a distance of 310,000 miles on Nov. 24, 2018 ahead of the Nov. 26 landing of the InSight spacecraft. This annotated view shows the spacecraft parts visible. 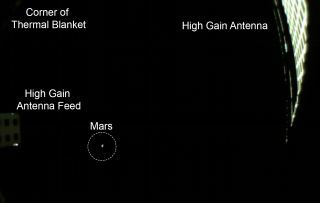 PASADENA, Calif. — A tiny cubesat cruising through interplanetary space has captured a new glimpse of Mars, just before watching NASA's InSight lander touch down the Red Planet. The cubesat, one of two Mars Cube One probes (called MarCO for short) snapped the Mars photo on Saturday (Nov. 24). That's two days before the InSight probe is due to land on the plains of Elysium Planitia Monday (Nov. 26) to study the interior of Mars. This photo was taken by the MarCO-B cubesat, showing Mars from a distance of about 310,000 miles (500,000 kilometers), according to a NASA image description. The twin MarCo cubesats are demonstration craft built to test the potential of tiny satellites for interplanetary missions. They launched with the InSight Mars lander in May, and are the first cubesats ever to fly an interplanetary mission. Scientists hope the MarCO cubesats can serve as a communications relay during InSight's landing on Mars, beaming telemetry from the lander back to Earth. Each MarCO probe is about the size of a briefcase and is equipped with an attitude control system that uses the compressed gas R236FA, which is commonly used in fire extinguishers. That prompted NASA scientists to nickname them "Wall-E" and "Eva" after the two robots who use a fire extinguisher to fly in space in Disney's animated film "Wall-E."
A clear view of Mars (lower left) as seen by NASA's small MarCO-B cubesat on Nov. 24, 2018. At the time, the spacecraft was about 310,000 miles from Mars. Unlike InSight, the MarCO probes won't stop at Mars. They'll fly by the Red Planet and continue on in the space between planets, NASA officials have said. Visit Space.com Monday, Nov. 26, for complete coverage of the InSight landing on Mars, including a live webcast at 2 p.m. EST (1900 GMT). Landing is scheduled for about 3 p.m. EST (2000 GMT).